I have installed Ubuntu 14.04.5 on a Virtual machine in my Windows 10 laptop. I installed XIlinx Linux version on Ubuntu. I wanted to try out basic Hello World application before I could proceed further. When I try to create a new application project in Xilinx SDK, it does not give me an option to create a standalone bsp. It shows Linux instead. I have attached a snapshot of it. Could you please tell me what's wrong? I want to be able to create a standalone bsp without any OS. Here is a xilinx forum thread that deals with this issue. When you made you HW project in vivado did you export you project and checked the box for include bitstream? I tried to follow that link. But they discuss about generating bsp for a microblaze project whereas I'm using Zynq. The document which is pointed to in that link mentions that Vivado 16.2 Linux support is only for Ubuntu Linux 14.04.3 LTS whereas I'm using 14.04.5. so does that mean I cannot use 14.04.5 to run Xilinx SDK? They also say that You need to start manually ./xsdk with root(sudo). I'm not sure how to do this? When you generated the bitstream for your zynq design in vivado did you export hardware including the bitstream? And then click launch SDK correct? ./xsdk with root(sudo) is launching SDK from the command line with root access and not from the Vivado GUI. Then accessing/loading your hardware design from sdk. Yes that is right. I exported the hardware along with bitstream and then launched SDK. When I try to give sudo ./xsdk it says command not found. I there anything else I need to do before that? I'm also trying to set up a serial port on Ubuntu to talk to my Zybo board. I'm getting stuck on gtkterm. is there any tutorial which explains how to do it? 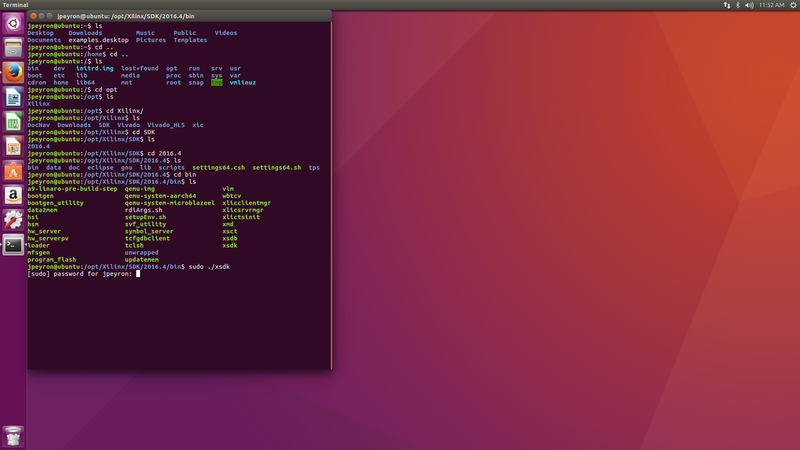 the command sudo ./xsdk should be used used with command line from a terminal when you have not launched sdk from vivado. If it does not find xsdk then go to the folder that it is located at screen shots below. Here is a link to a thread that talks about using serial terminals in the linux enviroment. Thanks for the clear instructions about starting SDK separately. I was able to follow all the commands and bring up SDK and was able to generate a Hello World application on a standalone bsp. As for the serial port, I went through both the links (the one mentioned in the link you provided too.) But I did not understand much. Sorry I'm a newbie to Linux and still trying to get comfortable with it. I guess I'm asking how do I know which port the serial port pppears on is it ttyS0 or ttyUSB0? How to we decide that. Currently I just configured ttyS0 to 115200 but I'm not able to program the board after that.